The Guardian: No more affectionate, even admiring tribute to a failure has been made than Tim Burton 's Ed Wood. This story of the man now dubbed the worst director in the world is a fine example of the argument that it is not what you achieve in life but how you go about it that's important. Burton 's film presents us with a man who, despite a lack of any discernible talent, proved that the triumph of hope over experience was not only possible but, given energy and faith, even certain. His movies got made, and they are still being shown today. This is both the strength and the weakness of a remarkable black and white film, since you get the feeling that Burton 's sense of optimism is fundamentally at odds with the final facts. Wood died a disappointed and embittered alcoholic and most of his collaborators came to less than satisfactory ends. But the film isn't about the sad decline. It illustrates best the years when this extaordinary man made such epics as Glen Or Glenda, Night Of The Ghouls and Plan 9 From Outer Space. Perhaps it's more like a fantasy based on the truth than the truth itself. Roger Ebert: What Burton has made is a film which celebrates Wood more than it mocks him, and which celebrates, too, the zany spirit of 1950s exploitation films - in which a great title, a has-been star and a lurid ad campaign were enough to get bookings for some of the oddest films ever made. It was a decade when there were still lots of drive-in movie theaters, cut-price fleapits and small-town bijous that thrived on grade Z double features. The people who made many of those films may have been hucksters and conmen, but they were not devoid of a sense of humor, and often their movies had more life and energy than their betters. America's theaters hadn't been centralized and computerized, and you couldn't book 2,000 screens with a single keystroke, and Ed Woods could thrive. Rolling Stone: Wood is an easy target that this sympathetic and endearing movie bravely resists. Burton's freewheeling take on Wood's life is comic without being cruel, satiric without being superior and moving without being maudlin. Burton has fashioned a celebration not of bad movies but of what it takes to get an uncompromised vision on the screen. Burton should know. He had to fight to do Ed Wood his way. Despite a below-average budget of $18 million (still 100 times greater than all of Wood's budgets combined), few studios wanted to touch a risky drag epic, especially since Burton insisted on shooting it in Woodian (read cheeseball) black and white. 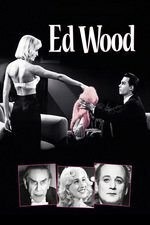 NYTimes: "Ed Wood" is in love with bad-movie high jinks, and with nutty, improvisatory film making as an antidote to the antiseptic slickness of today. But its real heart is in the Wood-Lugosi friendship. The aging vampire star, played with hilarious crankiness by an outstandingly fine Martin Landau, becomes a poignant figure even at his most bizarre. (Early in the film, Lugosi is seen at home in full cape and regalia, watching "Dracula" on television and holding a chihuahua in each hand.) Through all the humor about Lugosi's histrionics, and through pathos about his drug addiction, Mr. Burton's respect and admiration are unmistakable. WaPo: It’s impossible to overestimate the job that Landau does here as this sepulchral Hungarian. Both vocally and physically, he’s simply astounding. As Burton sees it, Lugosi and Wood were equally good for one another. Lugosi helped Wood sucker backers into financing his disasters, and Wood gave Lugosi a reason to live—plus a little cash to buy more dope. But Depp and Landau create a relationship that is far stranger and more tender than one built solely on mutual advantage. Like Depp and Vincent Price in “Edward Scissorhands,” the actors slip into a moving father-son relationship with Wood shouldering the burden of his aging parent’s deterioration. As time goes by, the need to bail Lugosi out of one crisis or another becomes the driving force behind Wood’s career. Oblivious to rejection, Wood presses on, beating the bushes for cash and creating work for his friend, despite the fact that, in the case of “Plan 9 From Outer Space,” he is already dead. Saw this film at the cinema, teamed with Plan 9. And soon after purchased Glen or Glenda. I've not watched it in the longest time (we have it on DVD) but I highly commend seeing it and the going in to see the original source material. A guy, a friend, in our row laughed so hard all the seats shook. Really, I think this was the end of Peak Tim Burton. Jeffrey Jones is great as Criswell here. He was pretty much great in everything he was in... except, you know.... his arrest photo. But the cast of Ed Wood is uniformly amazing. Even Depp. Before he became "DEPP!". This movie about terrible movies really fills me with the joy of the creative process, and after watching it I become enthused about making stuff - if not movies then comics or whatever. It's infectious, even when fairly honest about the quality of Woods output. Probably the best Burton, too. Gah, I know! We watched Ferris Bueller the other night with the kids, which I hadn't seen in many years. Seriously, he is *masterful* in it. "Oh man, he is great here...why did he have to be such a scumball in real life?" This is such a great movie and yes, the cast is just incredible. It seems like it was even more fun to make than it is to watch. It would have been SO easy to make it a sort of Christopher Guest style mockumentary and take cheap shots at this eccentric group of misfits. But it's always respectful, loving, and sweet. And Martin Landau is just tremendous in it. It's so hard to watch movies like this and think about the kind of crap Tim Burton and Johnny Depp have churned out together since. Talk about a creative relationship that just went in entirely the wrong direction. What if they'd kept making movies like this? There's a certain type of person, for whom filmmaking is not a profession, or even an obsession, but rather, a disease, or perhaps a psychotic break. I knew such a person, and for years he warped the lives of the people around him. it's a characteristic of this sort of delusion of competency that it can easily find and drag other people into becoming participants, under the notion that if the right breaks happen, their masterpiece will become reality. It was a horrible shock when I actually read his precious script, and realized that after all that time, he was an awful writer. And everything he promised was a fantasy. I haven't seen him in years. I have no confidence he's gotten better. And that's exactly what I suspect Ed Wood was. It was a horrible shock when I actually read his precious script, and realized that after all that time, he was an awful writer. But seriously, what you describe is reality. Many of us (away from the FTV structures) make films, realise it is all too hard and quit, but some people are driven and they hustle cash for shooting. Sometimes you get a Manos (THE HANDS OF FATE!) and sometime you get something worthwhile. But, like love, film is a drug. I watched this movie before I'd watched a lot of Animaniacs. Orson Welles' voice was dubbed in by Maurice LaMarche, who also did the voice for The Brain. Now, whenever I watch that bit, I assume that it's actually The Brain driving a Welles-shaped robot. I remember the first time I saw this movie. I was in college and we all went to see this movie in the village, a theater that had a balcony, opening night. People were dressed up, drag, a few vampiras, it was great. The place was packed. The scene in the tunnel of love when Ed finally admits he likes to cross dress, the theater was dead silent. And when Ed's future wife simply says "OK" the entire theater erupted in applause. You could just feel this surge of joy that she so easily accepted him for who he really was. It was one of the best moments I've ever had watching a movie-an entire audience unified. The friends I saw it with afterwards commented that Burton must have exaggerated how bad his movies were. I was the only one who had actually seen any and I told them right off "No. They are EXACTLY that bad. Yes, you can see the wall shake. Yes Tor Johnson was that ridiculous. Yes he often used stock footage. Yes, yes, yes." They were amazed. I've long maintained that Ed Wood shows what Tim Burton can do when he actually has a good script to work with ... Something that I don't think he's been terribly concerned about since. This remains one of my favorite movies. There's something about watching movies about people who are so, so very passionate about deeply silly things. Like, Strictly Ballroom takes you into this whole other world with its own rules. Same thing for this movie, except this a true story, more or less. I adore this movie, it's one of my all-time favorites. I love this movie. It is the only Tim Burton movie I truly love (or can even tolerate). But I love it. It is respectful and funny and good-natured and has so many amazing performances in it (Martin Landau is just amazing). Plus so many great lines ("worst film you've ever seen, huh? Well, my next one will be better!" just perfectly sums up Ed Woods' character in every respect). It's a wonderfully written, wonderfully directed, and wonderfully performed film. Wonderful film. Portrait of the artist as a strange, strange man.